Certain species simply last longer and remain fresh much longer than others. Some of the best are the North Carolina Fraser fir, Balsam fir, Scotch pine and Douglas-fir. Regardless of species, consumers must make the final judgment of quality by looking at, touching, feeling, smelling and shaking the tree. Learn more about tree types here. Cracks are not directly related to foliage freshness, a tree’s ability to take up water, or fire safety (these are problems that occur after a tree has lost much of its water content). I have bugs on my tree. What do I do? Christmas trees in North Carolina are grown in a near-natural setting, so unfortunately, your real Christmas tree may have an unwanted hitchhiker. Don’t worry, these unwanted hitchhikers do not bite or cause disease. They are just a nuisance. They are most likely Cinara aphids, spider mites, or praying mantids. They are NOT likely to be ticks. Most years, these pests are rare. Perhaps one tree in 100,000 has any one of these pests on it. Chances are you can get a real tree every year for the rest of your life and never be troubled with them again. The first cutting date varies, depending on when the first frost occurs. In general, Christmas trees are not cut before the first week of November, and most are cut very close to Thanksgiving. To be sure that you get a fresh tree, perform a simple freshness test on the tree by gently grasping a branch between your thumb and forefinger and pulling it toward you. Very few needles should come off in your hand. Is it okay to buy a tree that is losing its needles? What if some of the needles are brown? It is normal for a healthy Christmas tree to have dead needles near the trunk and in the bottom branches. As the tree grows, the interior needles receive less sunlight and start to die off. Bottom branches are trampled on, smashed against the slope of the mountain, or become entangled in a neighboring tree. Give the tree a good shake before setting it up to remove these dead needles. If the overall color of the tree is faded, the bark of the outer twigs is wrinkled and green, or the exterior needles fall off at the slightest touch, the tree is excessively dry and you should select a different one. It is much better environmentally to use a natural agricultural crop and recycle it after the holidays. Real Christmas trees are a renewable, recyclable, natural product grown on farms throughout North America. Unfortunately many people have the misconception that Christmas trees are cut down from the forest. Real Christmas trees are grown as crops, just like corn or wheat, and raised on a farm. 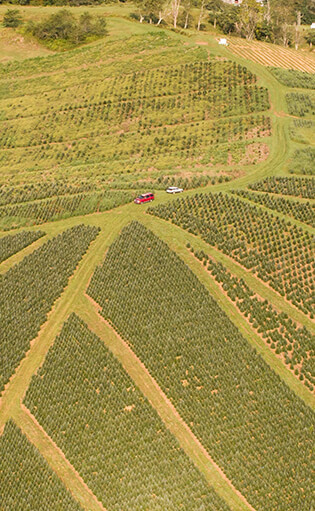 Once they are harvested, new seedlings are planted to replace harvested trees. These would NOT have been planted if trees hadn't been harvested the previous year. Fake Christmas Trees are a non-renewable, non-biodegradable, plastic and metal product most often made in overseas factories. What is the Christmas Tree Promotion Board (Christmas tree checkoff)? The Christmas Tree Promotion Board is the industry’s national research and promotion program whose mission is to share the benefits of fresh Christmas trees with consumers through promotion and public relations. Learn more about the Board’s marketing efforts at ChristmasTreePromotionBoard.org.